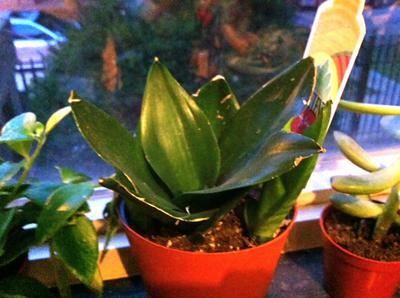 It's about 4" tall and has wide rich green flat leaves with no visible stem. Hi Jamie, this is my big objection to buying succulents at a big box store - not only do they sometimes come with baggage (bugs, bad treatment or damage) they also usually have no label. Consider yourself lucky that you got one that told you it was a succulent! My first thought is that this is one of the newer hybrids of Sansevieria, which have this type of striping on the leaves. There are several, mostly with vertical stripes of gold or silver, some are striped horizontally across the leaf. Very pretty in combination with other more brightly colored succulents. For care, these are cast iron plants. They're coming back into popularity for really tough conditions, and they don't really need bright light as other succulents. However, for the best coloring in the leaves, bright curtain filtered light, the occasional deep watering, and warm conditions will give you the healthiest plant. You can see more about Sansevieria 'Jade Dwarf' on Dave's Garden website for an example of this type of plant.